GIS/SIG Last Call for Abstracts: Deadline Jan 31! 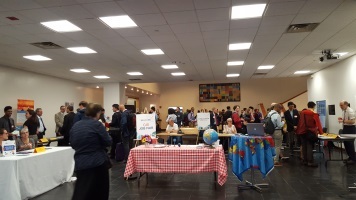 NYC GISMO GIS Job Fair a Success! Please read the below update from Tripp Corbin of eGIS Associates, Inc. dated January 25, 2019 related to ArcGIS Pro 2.3. Now you can open a new blank project without a template. This means all those project files that normally are created do not get generated. This makes it much easier to use ArcGIS Pro as a management tool like ArcCatalog. You can set ArcGIS Pro to automatically open a specified project. If you only use one project this could make your like a little easier and ArcGIS Pro start a little faster. The Split edit tool now allows you to select existing features to split a polygon into multiple parts. This gives it functionality similar to the Split tool on the Advanced Editing toolbar in ArcMap. I have been waiting on this one for a long time. Creating reports in ArcGIS Pro is now possible. Divide edit tool added for splitting a polygon in to multiple parts based on number of splits, distance, area and so on. There are many more. I just picked a few improvements I was excited to see. For more information, watch the video I just posted to the eGIS YouTube channel at https://youtu.be/z087o7SlIDQ. You can also find more information in the ArcGIS Pro help at https://pro.arcgis.com/en/pro-app/get-started/whats-new-in-arcgis-pro.htm. In my opinion, ArcGIS Pro has had the functionality 90% of most users need for a while now. This new release just makes it even better and is getting closer so that the remaining 10% will be able to consider moving over to it. I think back to when ArcGIS was first released around 1999 and how long it took to really get a stable working version. Looks like ArcGIS Pro is coming along even faster than ArcMap did. Of course it still does have its moments and if you do not have beefy enough hardware don’t even think about using ArcGIS Pro. Speaking of hardware, I have been running ArcGIS (both Map and Pro) on a new Ryzen 7 2700x system with an NVIDIA RTX 2060 for about 2 weeks now with good success. Plan to post some benchmarks and testing results in the not too distant future for anyone that is interested.